After separating from the Sunset Resorts chain of properties, the Jamaica Grande Resort knew a reimagining of its current branding and strategies would be necessary in order to fully establish itself as an independent entity while promoting business growth and impacting brand awareness. Knowing this would require a truly unique brand experience, the resort tapped the evōk team, known for crafting innovative creative campaigns, for support during the transitional period, as well as in creating an immersive brand identity. The all-inclusive, 730-room Jamaican resort offers a slew of amenities fit to cater to the needs of extreme thrill enthusiasts and relaxation seekers alike. A vibrant beachfront property, the Jamaica Grande Resort boasts an unbeatable location in the heart of Ocho Rios, making it a highly desirable destination for travelers from across the globe. While the island’s resort category is anything but sparse, the Jamaica Grande stands out amongst its competitors for its commitment to deliver a truly authentic Jamaican experience, infusing the spirit of the tropical destination into every part of each guest’s stay. 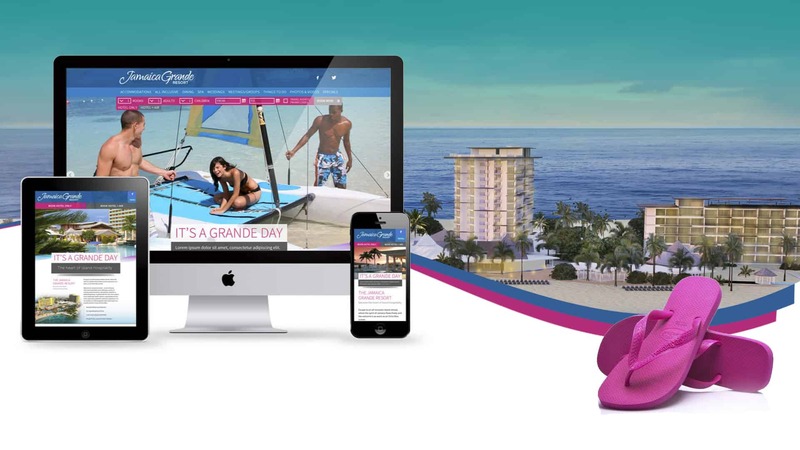 Taking notice of this unfaltering dedication to island hospitality, we crafted a multi-dimensional, cross-platform branding strategy, digital, and interactive experience fit to carry the resort’s messaging to key audiences. When developing a brand identity capable of conveying the Jamaica Grande’s warm and inviting island culture, as well as accurately representing the grounds’ lush, lively landscaping, we looked to the resort’s tropical location for inspiration. We created a windswept, custom font to be used for the resort’s logo, positioning it as a relaxed yet distinctive retreat. Our team further tied in the Jamaica Grande’s beachfront location to the branding collateral by designing a “wave” accent to be used on pieces during the transitional period before the re-brand’s official launch. As an initiative designed to drive traffic to the brand’s Facebook page, we launched a contest crafted to boost fan base numbers while positioning the Jamaica Grande as the ideal destination for romantic getaways. The “Ring in the New Year Facebook Contest,” strategically scheduled to follow the timeframe with the highest engagement rates, invited Jamaica Grande fans and Facebook users, targeted through social media advertising, to submit their engagement story along with a photo of them and their significant other in order to win a prize. Our team also created a highly targeted Facebook marketplace advertising and promoted post campaign to support the contest efforts. Ads targeted users who were engaged as well as users who listed wedding-related interest categories. Additionally, we crafted an image-driven, fully responsive site with a modern, vibrant design that speaks to the resort’s personality while showcasing the updated look and feel of the brand. With the creation of a beautiful and functional photo and video gallery, a dynamic contact form and the inclusion of randomized customer testimonials at the foot of each page, evok’s interactive team was able to blend functionality and efficiency with high-concept design. The creation of a unique and comprehensive brand look and feel has propelled the Jamaica Grande brand’s recognition and awareness. The updated Jamaica Grande identity embodies the spirit of the island while staying true to the resort’s inviting nature and vibrant culture, crafting a truly unique brand experience that remains authentically Jamaican. Our work on behalf of the resort on the social media front has resulted in the astronomical growth of the resort’s Facebook fan base from 5,000 to over 62,000 within six months.